Bristol is leading by example in taking action on climate change and we have committed to being a carbon neutral city by 2050. Since 2005, Bristol City Council has delivered a wide programme of energy efficiency and investment initiatives, investing tens of millions of pounds in renewable energy generation and energy efficiency and meeting our 2020 corporate carbon reduction target three years early. We are now moving forwards with innovative pilot schemes that will help build the city’s future smart energy system. This level of delivery, coupled with the city’s thriving community energy scene and a wealth of socially responsible organisations, is just one of the reasons why Bristol is internationally recognised as a leading energy city in the UK. Building on all that we’ve achieved, we need to up the pace of delivery to help us meet our 2050 target. Through this Prospectus, we are seeking long-term partners to work with us to achieve our shared goals and build a resilient city where no one is left behind. City Leap is a series of energy and infrastructure investment opportunities that the council will be publishing over the coming months and years and represents a big step towards a resilient future. This will not only create a healthier and fairer city for all our residents, but also allows us to share our success. It will help to create jobs, maintain our economic competitiveness, de-carbonise the city, build strong partnerships and empower people to take their future into their own hands. 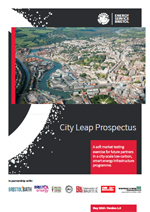 The full City Leap opportunities are outlined in our Prospectus – a public document which issues a call out to those organisations, investors and innovators that have the vision, energy and the heart to join us in becoming the architects of Bristol’s sustainable future. This is our opportunity to deliver something truly transformative for Bristol, building a citywide energy system that will protect the environment and improve the quality of life for the people of Bristol. We look forward to working with partners of all sizes and sectors to achieve our aspirations and hearing the new ideas that you can bring to the table. Our Mayor and Cabinet approved our City Leap Energy Partnership, which will result in the setting-up of a joint venture with one or more Strategic Partners, at the 2 April 2019 Cabinet meeting. This is an important decision for Bristol – a huge milestone on our journey towards carbon neutrality and, once it has been established, the City Leap Energy Partnership will be open to working with a broad range of additional partners in the future. We will shortly be commencing a procurement exercise to find a partner that can work with us to unlock Bristol’s full potential and deliver the social, environmental and economic objectives for the city. More information (including our Cabinet reports) are available on the council’s democracy website and in our most recent press release. The full Cabinet meeting can also be viewed on-demand as a webcast via our YouTube page. Our expression of interest window ran from 9 May – 31 August 2018 and has now closed. We’ve been overwhelmed with the brilliant response from 180 organisations of all types and the detailed discussions about partnership opportunities that followed. The information that you submitted will be kept confidential and reviewed only by a small working group of Bristol City Council employees and our partners. For added confidence, you can read our Privacy Statement here.